Roofs in Florida are constructed to withstand high winds, hurricanes and very heavy rainfall. Florida building code states that that roof joists be covered by strand board a thick solid board that ties all the roof trusses together making the whole roof construction extremely rigid. The roof structure is then covered with a thick waterproof sheet called the underlayment sheet, the underlayment sheet is made of fiberglass and asphalt and as long as it is sealed properly around pipe work and vents it will make the roof waterproof. The Roof tiles are then added, Roof tiles in Florida are nearly always concrete overlapping and interlocking tiles which provide the maximum protection from water ingress under high winds. In the roof valleys where two pitches meet tiles are cut and butted up to each other this allows water to get in behind the tile and onto the underlayment sheet. Water that gets behind the roof tile travels down the underlayment sheet and exits from vent holes in the the eave closure strips (see diagram below). CAUTION: Caustic roof cleaning chemicals including Chlorine and Sodium Hydroxide will rot tile roof fixtures and fittings leading to early and expensive repairs to your roof. Roof Tiles are mechanically fixed to the roof board usually with a screw, they are perfectly safe to walk on but care should always be taken as there are many tripping hazards such as tile edges and vents to avoid. The screws that fix the tiles to the roof board go through the underlayment sheet, the screw threads tend to seal themselves as they go through the soft asphalt sheet. The Capping Tiles or Ridge Tiles that finish the top of roof edges are also mechanically fixed to the roof board, the gaps between the capping tile and the roof tiles are then filled in with a cement mix usually matched to the color of the roof tile. This completes the roof construction. Q. Will my roof leak if it is power washed? A. No, power washing a tiled roof is perfectly safe. Q. Will Pressure Cleaning damage the surface of the tile? A. No, Roof Tiles can withstand many years of regular cleaning without showing any signs of wear. Q. Will pressure cleaning damage the underlayment sheet? A. No, The underlayment sheet is protected by the tiles. Q. Will walking on the roof damage my tiles? A. Our contractors are always under the *safe weight limit* We guarantee no tile breakages. The above illustrations will help customers to understand that total roof care is about more than just cleaning, effective long term care requires regular inspections and maintainance. 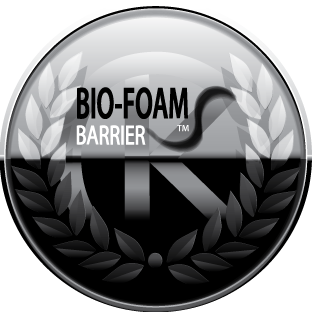 For best long term results use our Bio-Foam Barrier ™ algae control system. Florida's 1st Green Certification Program for roof cleaning contractors.